The more it cost the happy they be. Sounds fine by me, I’d happily live in the sticks but still cycle 10-15 miles to work in a city. If you can’t afford the travel then get out of the country pad and into a high rise. Hopefully bring down the prices in the countryside. 1. Good. All you moterheads can pay your part towards the recession as well! Don't see why gas guzzlers should be given a tax concessions when families are being targeted hard. What a stupid comment. Dont "hard working families" have cars too? It'll also bring down the prices of used gas-guzzlers. And i need one as i'm having a mid-life crisis at the moment. Where have the fuel protestors go ? Did the government buy them off ? Did they threaten them ? With the costs involved now i'm suprised there is no protests. It will kill the last of the EVO & Scoobys...............think about it...............24 mpg cars.......(Autocar only 20 from their last Evo! )...............if he bought it a few years ago when it was 80p....now £1.20.......soon £1.60. So his "24 mpg" is in effect "12 mpg !!! "................Throw in massive other taxes vat & the road tax going to almost £500 a year & its game over. You think its a good thing to have the first 2 hours of work taken off you for travelling costs? Are you just saying let them eat cake? City centre property isn't exactly cheap either and nor are the rents, so people live far out. The microcosm of Hong Kong is an excellent example, rents are higher as you get closer to Kowloon, the problem is you spend more money on commuting therefore it makes less sense. You are wrong of course... namely because you can make a performance vehicle out of less much less, you get motorbike engined cars which do 50mpg which are absolute beasts, they are really spartan inside and are just enough to pass the SVA test but they are absolutely awesome. I had a drive of a CBR929 engined go kart thing which was legal for the road. The bigger wheels on the back meant more power could be put down than the CBR929 and the gearing was awesome. Stick a body shell around it and you could get 240mph out of it. Most modern bikes can easily hit 200mph but the styling prevents it as dustin fairings were banned in racing. Good chart, but it's a shame it didn't have 2008, 2009 on too. It just shows how little the oil price matters to our pump price though, as the vast majority is bloody tax! I actually get 20mpg on the motorway and 9mpg if I thrash it in my evo. And it will only run on super unleaded. Still, taxes are only going to go up, as is traffic congestion. It's now or never, and as childish as it may be, leaving most bmw/aston martin/maserati/whatever for dead at the traffic lights is very fun. Pity the interior is made out of paper though. The road tax is £435 at the moment, but the biggest cost is the servicing and parts. It needs servicing every 4500 miles, and it eats tyres (£600 a set) and brakes. I would imagine it's pretty much the same running costs as a porsche/ferrari, but without the massive initial outlay. We drive a diesel A3, petrol polo and a lotus elise (1.8). All get 40+ mpg even the lotus! The problem is that people buy the wrong sort of car for the job in hand. If you live 15 miles from a city it’ll take you 2 hours as you say, on a cycle. If you drive however, assuming a normal 9am start time, it’ll probably take you 45 mins as well, with 30 of them in the last 3 miles. Rents/prices in the country/suburbs give more feet per pound than the city does. I’m not going to get stats on this, but I’m pretty certain that ‘countryside’, demographically, will have older people living there (hence cycling becomes problematic), and a large chunk of holiday homes. I want a crash, so anything that forces people to sell at a reduced rate is a good thing imo (driving down the holiday homes price too). Let them eat cake? Maybe I am saying that, although if a few hundred or even a few thousand pound a year means they are overstretched, then they should not be living in the sticks in the first place. Anyone making a housing decision should factor in work costs and possible huge hikes in fuel costs, VAT and interest rate rises. The downside for me is that any fuel tax rises will reflect in other commodities. Rubbish. Nobody buys a car like that to charge up and down the motorway clocking up miles, or to do a huge commute. It seems a good way to tax. From what I can see with the roads packed with cars people are happy to pay the £1.20 a litre. But people who really want to avoid the taxation can, by driving a smaller vehicle, by not choosing hobbies which require long distance driving, by carpooling, by not going on vacations that require long drives. By putting their shopping into one trip and so on. My personal reaction to petrol tax being so high is pretty fullsome.. I live in a rural english county, I need to get about and use a car do so, I do about 20,000 miles a year... if the petrol tax I paid helped us get faster broadband, a better council service, grit on the roads, more policing, better schools etc then fine, but it doesn't... it goes from our rural county to cities and "regions" like scotland. .... however with my more rational hat and recognising that its my choice where I live and no system is perfect I have recently hit on the perfect solution... I run a pre-1972 land rover ( roads not being gritted won't trouble me) with a 3.5V8 but I run it on LPG at 53p per litre... works a treat, no road tax, relatively low insurance, big engine but very cheap fuel. ( I only pootle about so that makes things better still)..... we also run a very very economical little ford diesel......... so while the tax would annoy I have tried to organise things to pay as little as possible.... this type of tax hike though I do find very interessting as it really does change behaviour... manufacturers I feel are making real headway producing different forms of engines, people are buying much more fuel efficient cars... or when the oil price was high loads of people around here bought wood burners and there has been a rash of wind turbines ect going up.... things are a changing which is great but I plan to evolve my own way of doing things by paying as little tax as I practically can. It's still expensive though. I would go further and scrap the road fund licence and put it all on fuel - pay as you go taxation. 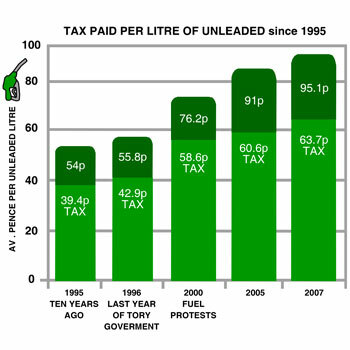 People will argue taxing petrol is 'regressive' though, as the rich pay the same as the poor. It's surprising really, as governments love playing Robin Hood these days. Eitherway, petrol costs a small fortune. Alot of people are now spending £70+ a week on just doing the daily commute, but if you take the train you also pay a fortune and the chances are, your live no-where near a station so you;d have to drive there anyway! What are they going to do when we all have electric cars? Anyway petrol is still pretty cheap. I mean people in pubs down stuff for £4 a litre over and over again and don't complain and petrol = 1000 man hours of labour. 377mpg 125cc motorbike real world conditions. I get a strange satisfaction from hypermiling. For some inexplicable reason I find it infinitely more enjoyable trying to brake as little as possible than flooring it at traffic lights like Mr Evo above. I've driven plenty of fast cars over the years but I don't really 'get it' on public roads. Fun on a racetrack though, but that's entirely different. Trikes etc might be fun. But unless they are fully enclosed you might as well have a bike and get the traffic dodging advantages as well. Also you'd never get me strapped into something less visible than my bike. Sorry last posts links messed up . nice, but I don't think you will get many folks onto bikes due to safety /stability issues. They will want something more enclosed & 'car like' . Reverse trike style micro / bubble cars happened in the austere 1940/50s. Having had a brief chat with DVLA, to get them more easily through the approval red tape, a couple of interesting points arose. They like you to bolt together existing road legal vehicles, not weld them, and if 2 back wheels are less than 46 cm apart ( from the wheel centres) they count as one wheel. Passing the regs. as trike is much easier than a car one. count as one wheel in passing regs. Its a strange way of 'reducing emissions' the road fund licence - some old guy near me has a big Jag - pays nearly £500 road tax a year -but He probably drives it less than 1000 miles a year -dont care how big the car is - its hardly ever used - like you say, it only really makes sense to charge tax on petrol. OTOH i agree with the libdems that people in rural areas who have less public transport provisions should pay less - maybe offset by an annual registration charge for Londoners who want cars - given they have the benefit of a massively subsidised public transport system. Id still have a luxury car tax or double rate VAT on cars over £30k - dont even think it would cut sales - people are so vain where cars are concerned in this country theyd probably pay more in tax than on the car RRP itself.